Saché Jones explains how Fresh at The Avenue brings fresh produce to West Baltimore. On the afternoon of Sunday, February 22, some 75 people attended the Second Annual Black History Month Party with a Purpose hosted by MRIA’s Social Action Task Force. The crowd’s generosity made this the SATF’s most successful party yet, collecting over $1,300 for two neighborhood organizations, Fresh at The Avenue and the Brown Memorial Tutoring Program. Don Palmer served as master of ceremonies and DJ, and hosts Michael Booth and Kristine Smets again opened their home for the festivities, as they did last year. 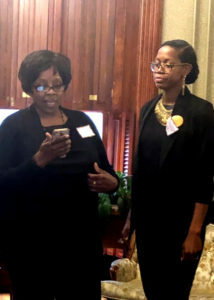 Guests included local jazz hero and community advocate Todd Marcus, No Boundaries Coalition’s Executive Director Ray Kelly, City Councilman Eric Costello and State Senator Barbara Robinson, as well as many Bolton Hill neighbors. 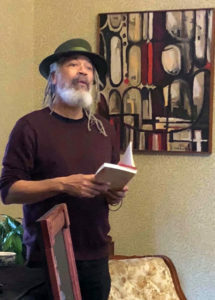 The program started with brief presentations by Saché Jones describing Fresh at the Avenue’s work selling fresh local and organic produce at the old city market on Pennsylvania Avenue. Amy Munds then explained the unique, inclusive approach to literacy adopted by Brown Memorial Tutoring Program in their work with Mt. Royal Elementary/Middle School and elsewhere. 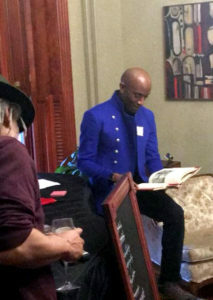 Don ably led partygoers who volunteered in presenting readings to the group, ranging from poems and speeches to passages from books and letters. Both well-known and not-so-well-known black writers and leaders throughout American history were represented. In most cases, the guests would try to guess the author after each reading. Highlights included Don’s food-themed books and soundtrack for the party (see lists below), a joint reading of Maya Angelou’s poem “Phenomenal Woman” by female members of the Kendra Rice Parlock family (and Kellie Wellborn), a Mary McLeod Bethune speech from 1938 read by Rob Helfenbein, and a reading of Paul Laurence Dunbar’s poem “Trouble in de Kitchen” by Michael Runnels. Food at the party included an herbed fruit salad from Fresh at the Avenue, Cajun chicken pasta from Ida B’s, Poppay’s rolls from the Avenue Bakery, and red beans with andouille, black rice, and Hoppin’ John courtesy of Don Palmer. Guests brought additional goodies along with plenty of wine, beer, and other beverages that added substantially to everyone’s enjoyment. Taste of Freedom: Hampton Institute Recipes and Remembrances, Carolyn Quick Tillery. Thanks to the Social Action Task Force for sponsoring this event, especially the main organizers, Michael Booth, Rob Helfenbein, David Nyweide, and Don Palmer. Let’s do it again when Black History Month rolls around again next year!